The Rameshwara Jute Mills Ltd (RJML) incorporated on 20th August 1935 is a public limited company listed with the Calcutta Stock Exchange Ltd. The Company commenced its jute business by purchasing a Jute Mill at Muktapur, PO & Dist : Samastipur, Bihar from Hon’ble Maharajadhiraja Sir Kameshwara Singh Bahadur, Maharaja of Darbhanga. An amalgamation of Birla Gwalior Limited with RJML in 1976 gave further impetus to RJML’s business activities under the Chairmanship of late Madhav Prasad Birla and the Company diversified its business into mining activities and rendering of business support services. 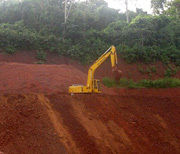 The Company’s Baraiburu-Tatiba Iron & Manganese Ore Mines are situated at West Singhbhum, Jharkhand. The Mines are spread over an approximate area of 258.98 hectares. The Company sold its Jute Mill in 1986 and at present, the Company’s main focus is on iron-ore mining. The Company’s Business Support Services Division is located at New Delhi. To be a respectable mining company, cherished by our customers and the community in which we work.